​A Dado Rail, also known as a chair rail, is a type of Moulding fixed horizontally to the wall around the perimeter of a room. Usually about one metre above the floor along all the walls of a room. 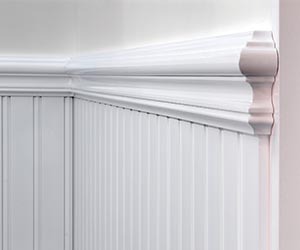 A Dado rail is unique, as it can transform a normally bland room into something spectacular. A Dado Rail is also used to create individual areas in the home, and allows you to play with colour as you can use more than one colour and separate them with the Dado.